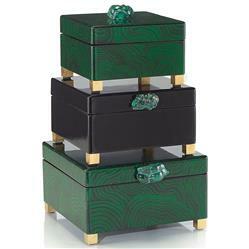 This stylish set of three deep green and black lacquered boxes has magnificent Malachite emerald-tinted stones for lifting the hinged tops. Each jewelry box is accented with polished gold feet. This stackable trio will add drama to your favorite table while storing personal items and keepsakes.